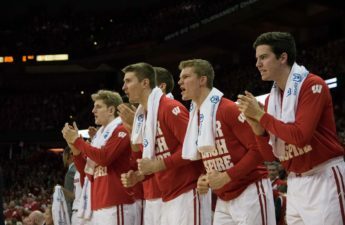 Free throw shooting has been anything but free for the University of Wisconsin men’s basketball team this season. 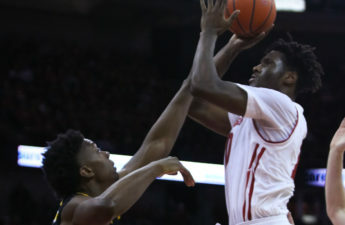 The two biggest culprits happen to be the two Badgers who get to the line most often: redshirt sophomore forward Ethan Happ and senior forward Nigel Hayes. As a team, UW makes only 64.4 percent of its attempts. The only team worse is last-place Rutgers at 62 percent. The Badgers made more than 70 percent of their free throws last season and finished second in conference two seasons before that. The woes compounded as the season wore on, particularly for Hayes and Happ. In the three games before entering the Big Ten tournament, Happ was 2-for-14. Hayes was 10-for-28 during the regular season’s final four games. Perhaps even more troubling is the regression from both players. Last season, Happ shot free throws at 64.3 percent (108-for-168). Hayes is currently just worse than his freshman year free throw shooting performance, when he made 58.5 percent of his attempts. 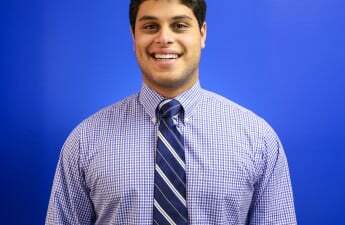 He improved the next two seasons, jumping to 74.4 percent and 73.6 percent from the line his sophomore and junior years, respectively. It’s not lost on Hayes that free throws will have to improve if UW wants to make it far in the tournament. Just how baffling is this recent development? “I guess I’d rather overthink than not think at all,” Hayes said. There is only one way out of the rut, according to Hayes. In the 2015 Big Ten Championship game against Michigan State, Hayes stepped to the line 12 times. He made all 12 — the most free throws attempted without missing in a conference tournament game. He was 16-for-16 that tournament. 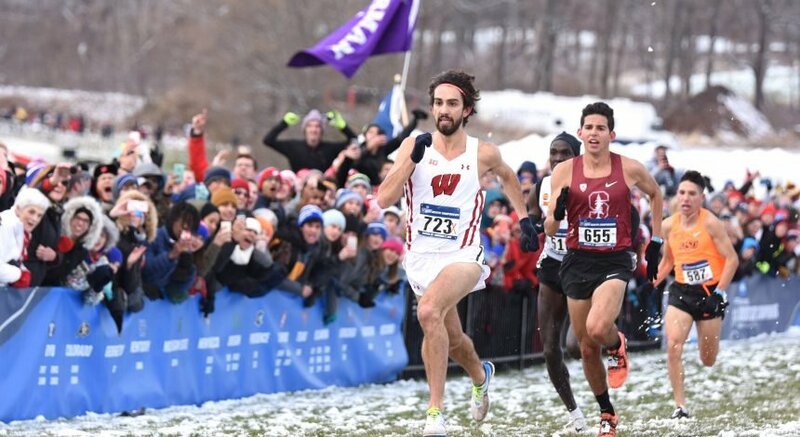 Against Iowa, Happ missed a pair with 30.5 seconds and UW leading by one. If he made both, Jordan Bohannon’s 3-pointer with less than 10 seconds left means overtime, not UW’s fifth loss in six games. 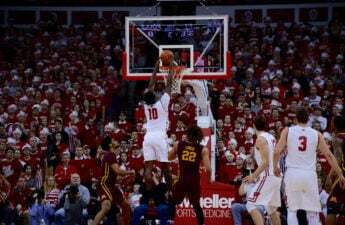 It was a different tone than what Gard used several days earlier after a win over Maryland. Gard said he didn’t lose sleep over struggles from the line at the time. He did, however, offer a joke to demonstrate the exacerbation. Not all Badgers struggle from the line. Senior guard Bronson Koenig shoots at a 91.1 percent (51-for-56) and fifth-year senior Zak Showalter makes 82.2 percent of his attempts (37-of-45). 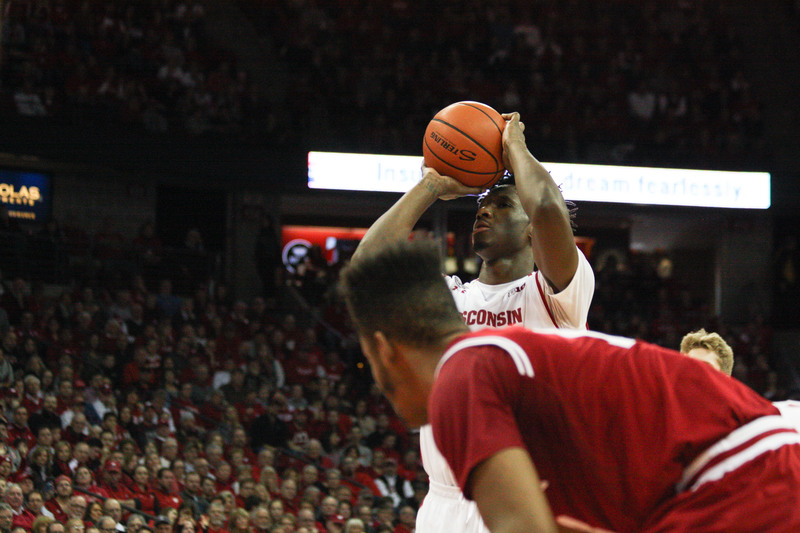 The next most attempts from the line come from sophomore Khalil Iverson, who shoots at just a 54.8 percent clip (23-for-42). Iverson said he always had difficulty with free throws because of lack of arc on his shot. But free throw success might be contagious, Iverson said. The coaching staff is well aware free-throw shooting is a thorn in the side as the NCAA Tournament approaches. 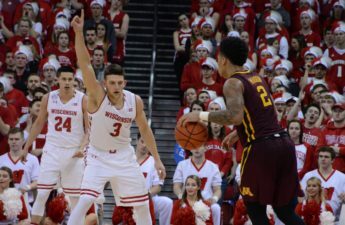 “They’re struggling in a big way and having a hard time finding something they can go to and rely on to get it back,” UW associate head coach Lamont Paris said. Has he noticed anything? Other than the fact that the duo’s confidence is clearly shaken? It’s not for lack of volume of attempted shots, Paris claimed. UW shoots more free throws during practice than any team in the nation. Somebody somewhere would have made a lot of money by now for creating a solution to free throw woes. Senior forward Vitto Brown said he stays away from giving advice because there’s enough people in their ears to begin with. No matter how hard they work during, before and even after practice, the improvements have to show up when the lights shine brightest, assistant coach Howard Moore said. UW tries to wear them out in practice and make them practice to shadow fatigue. But there’s no way to simulate an arena atmosphere on a Tuesday afternoon practice. “We can’t just bus 17,000 people into practice,” Moore said. Moore said the technical aspect of it is no longer the issue, rather the block occurs from the neck up. Whatever struggles persist come tournament time, it won’t be for lack of effort.